As a native of the South, I understand all too well that some of the best cuisine to be found anywhere hails from my part of the country, an assertion which is backed up by the fact that some of the best cooks to be found live below the Mason-Dixon line. I say cooks, not chefs, because in the South a cook is someone who prepares great food and a chef is someone who is looked at with a slight air of scorn because they had to be sent away to school to learn what the rest of us learned standing alongside our parents, grandparents and even great-grandparents in the kitchen. Except for me of course. I am neither a cook nor a chef, although I enjoy food which is, I suppose, the reason that Cousin Hilary asked me to be a guest writer on her blog while she was indisposed (that too, is a Southern expression meaning that one has either had a baby or is serving time; in this case it is the former of course). Her instructions were simple in this assignment; explain who I am and how I know her and then post something relevant to her blog about cooking something delicious. Hilary is my first cousin once removed, which in the South does not mean that she was formerly my cousin and somehow found herself excommunicated from that role, as the title might mislead one to believe. That phrase simply means that she is one generation removed from her mother, my first cousin Kim, who is the daughter of my Aunt Jeane, who was the sister of my father. Now that she and Greg have had their first child, Natalie Rose, I have a new cousin twice removed. On the other hand, my son Ethan is Hilary’s second cousin. Confused yet? Southerners take all this in stride, preferring to forego all of the hyperbole and refer to everyone they are related to as “Cousin” regardless of how removed they are. Then we go beyond that and just shorten it to “Cuz” when addressing a cousin because it makes us sound a little less like we stepped out of “Gone With the Wind” and because sometimes you forget their name at the family reunion. You can always be assured of being on safe ground when that happens because you have a family noun that works as well as a name and is both accurate and endearing. Regardless of the failings of memory, to a Southerner, a Cousin is a highly regarded member of the family. Depending on their age, they are the perfect addition or substitute for the more mainstream members of ones family. If they are a generation older, they become surrogate aunts and uncles and if they are a generation younger, they become like nieces and nephews. If they are close to your own age, they are like having brothers and sisters without all the emotional baggage that siblings can create. Cousin Hilary, as most of her longtime friends know, was raised in the North but I have always held the suspicion that inside of her was a closeted Southerner waiting to get out. She was raised with a strong helping of Southern DNA from her mother, a native of Alabama, who went off to Ohio to marry Hilary’s father, taking with her the accumulated cooking knowledge of generations plus a 50 pound bag of grits. 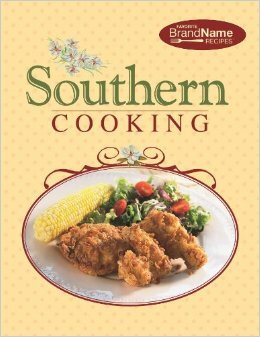 Once Hilary made the move to the South, she immediately began imparting her cooking knowledge to others, a true trait of the Southerner. It is a miracle that Greg can get through the door. Now that you are familiar with the back story of how Hilary and I are related, I should probably get to the part of this assignment which is the section on food. As I indicated earlier, I am neither a chef or a cook. In the South, most (but not all) men know how to prepare three types of food: barbecue, chili and anything frozen from the freezer. We also know how to make a reservation, but that doesn’t count. I do know how to make French Toast, which was the only thing my grandfather knew how to make and which he passed on to me but that’s another story. If you were expecting some great revelation from me on the art of cooking chili, I’m afraid you’ll have to wait until my father passes his recipe on to me. Since my family is in the professional barbecue restaurant business and most of our cooking methods are shrouded in a veil of secrecy and intrigue, well…I could tell you but then I would have to kill you. In this case, I’m going to go into the proper way to prepare and cook that staple of bachelorhood and college dorm days, the ubiquitous frozen pizza. Frozen pizza is safe ground and since my family is spending part of the summer in Florida, a necessity at times when there isn’t anything else in the house to heat up. To most people, there are two kinds of pizza: a). pepperoni, and b). everything else. Pepperoni is the pizza you never outgrow, kind of like the vanilla ice cream of pizzas. 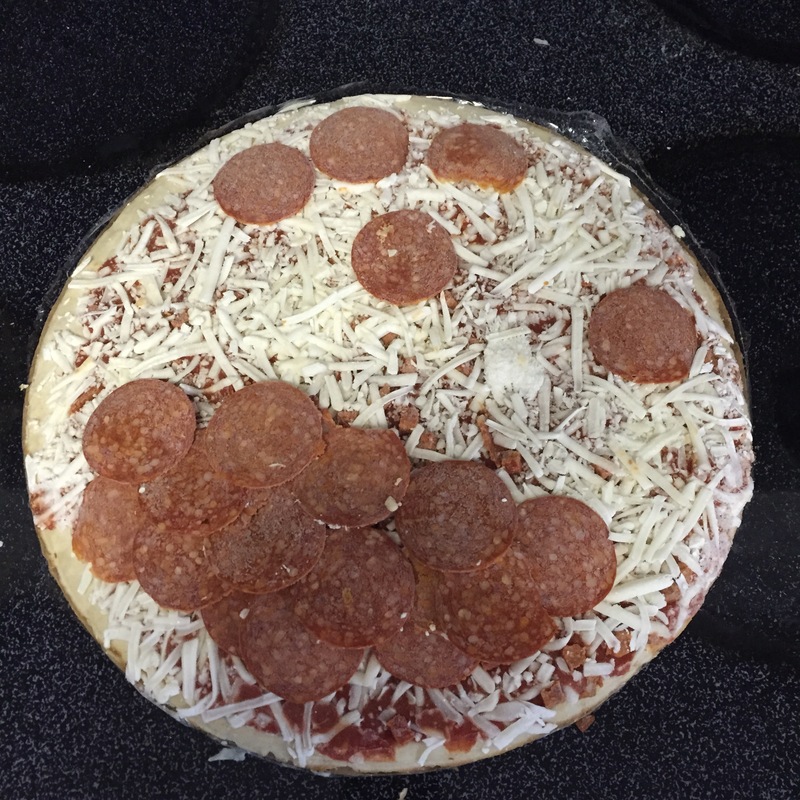 When dealing with frozen pizzas, I usually prefer a DiGiorno or a Tombstone and since there happens to be a Tombstone in the freezer, that is the one I will go with here, laid out in easy to follow steps. 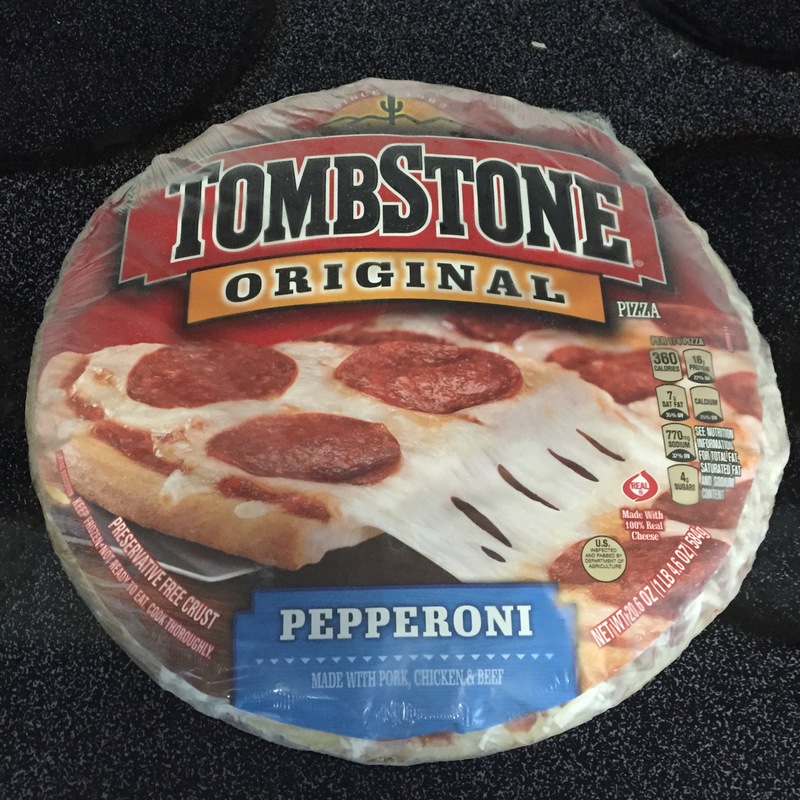 To cook a frozen Tombstone pizza, there are a number of preparation steps that should be taken to help ensure that the final product is perfectly rendered. You might not think these steps are important but each one plays an integral role in the overall presentation of the pizza. Step 1 is to TURN THE OVEN ON. This should seem like the most obvious step but occasionally, left brained people will get distracted by a phone call, fighting cats or anything advertised on television as being in “limited supplies”. There is nothing worse than popping your frozen pizza in the oven, only to come back in 20 minutes to find out your pizza has thawed in the oven at room temperature. 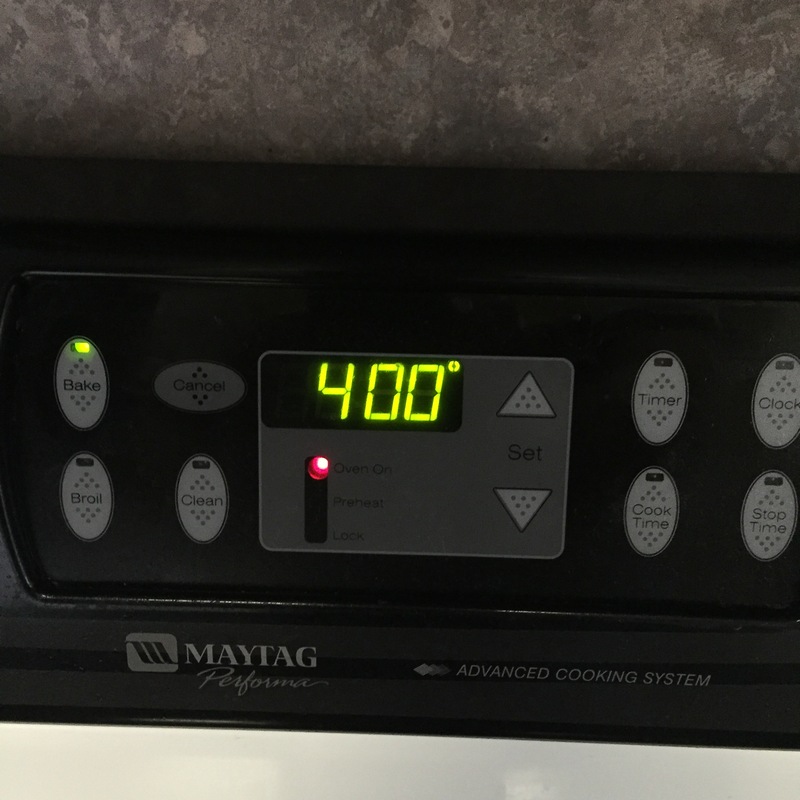 Set the oven to 400° and let it preheat. It is best to leave the pizza in the freezer until the oven is ready (Tombstone’s instructions, not mine). Step 2 is to PREPARE THE PIZZA itself for cooking. As soon as the buzzer goes off telling you that the oven is preheated, go ahead and get the pizza out of the freezer. Hopefully you remembered to remove the baking stone from the oven before you turned it on; if not, you will have to find something else to cook the pizza on. Preparing the pizza is a lot more than tearing off the clear plastic shrink-wrap, sticking it on a baking stone and putting it in the oven. The pizza comes on top of a round piece of cardboard with an overlay paper that shows the name and type of pizza it is, all wrapped up in shrink-wrap. If you tear this plastic off, small pieces of frozen cheese are going to go everywhere and either you or the cat are going to have a mess to clean up. Get a pair of kitchen scissors and carefully cut the plastic off as demonstrated in the photograph. As you can see from the photograph only a few pieces of cheese escaped but if this had been down the other way, it would have been a lot worse. Once you remove the plastic overwrap, remove the paper and this is what you will see most of the time. Pepperoni shift is a common problem with frozen pizzas due to their being stored upright in the freezer section of your local supermarket. Gravity causes the pepperoni to wind up in a pile on one part of the pizza and although the temptation is there to leave it alone and later claim this half of the pizza, there are good reasons why this isn’t a good idea, which I will get into a little bit later in the article. The solution is easy and will ensure fairness and well-balanced taste and this leads into the next part of the preparation. 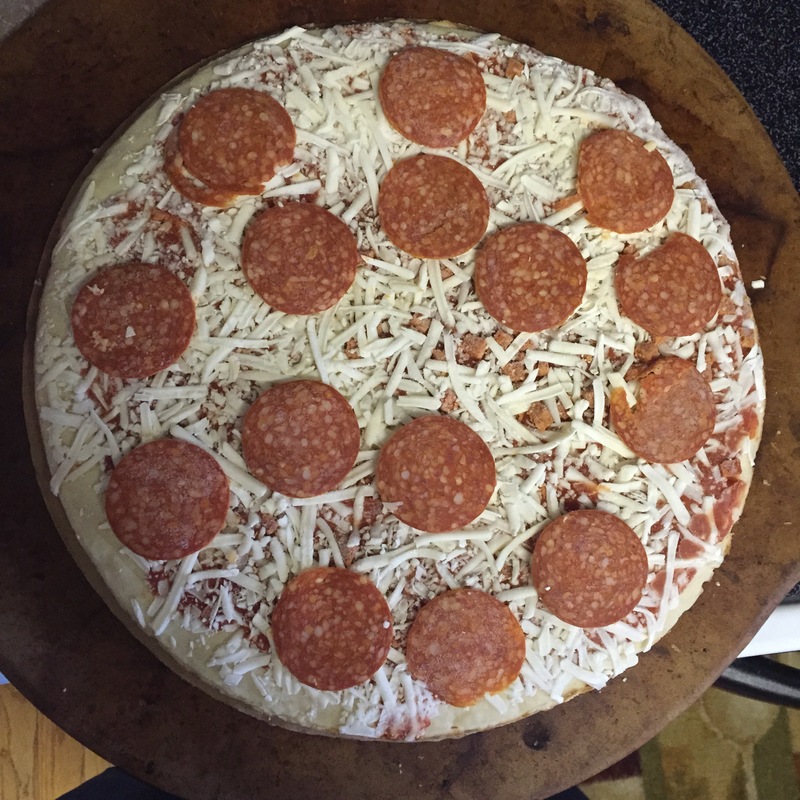 Carefully arrange the pepperoni on the pizza in such a way so as to make sure that no pepperoni meets an untimely death at the hands of a pizza cutter. 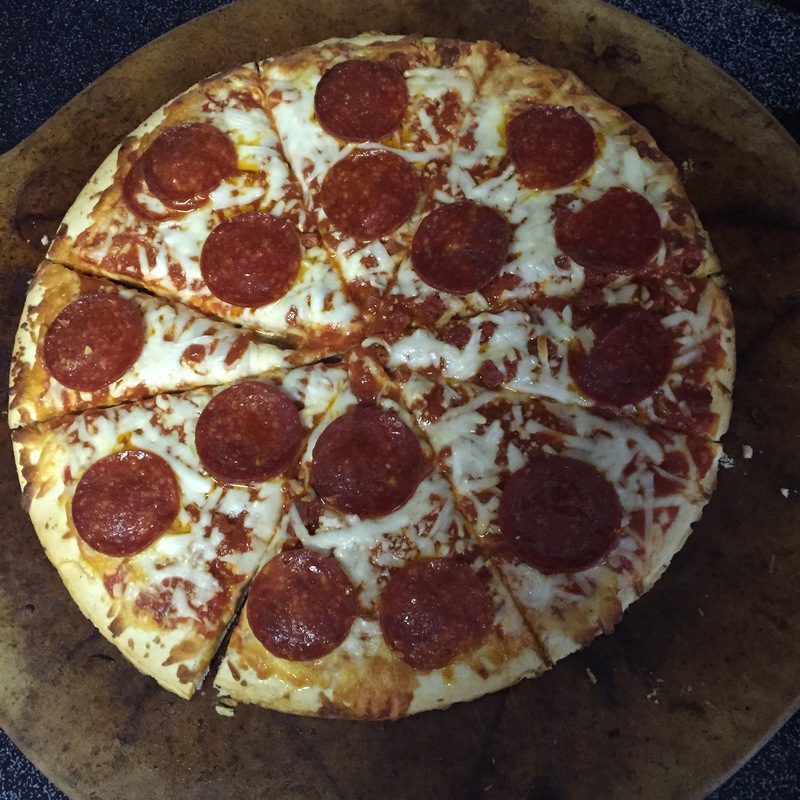 If you have children, they will watch to make sure when you cut this thing that if a piece got cut in half, that no one got the bigger half of the pepperoni so its best to make sure that there aren’t any partial pepperoni on a piece after cutting. Wars have been fought over less. Now your pizza is prepared and ready to cook. Make sure that you DON’T LEAVE THE CARDBOARD under the pizza before you cook it. While literature teaches us that paper doesn’t burn until it reaches 451°F, it is not a chance you want to take. Step 3 is to COOK THE PIZZA. The instructions call for placing the pizza directly on the oven rack for cooking but this is where I tend to deviate from the instructions and for good reasons too. One, the pizza will get soft in the oven and there is always the potential for toppings to slide off into the oven. If this doesn’t bother you, be sure you have a self-cleaning oven to help burn away the burned cheese pieces and sauce drippings. Two, getting a pizza out when it is hot off of a burning hot oven rack can be tricky and sometimes harmful to the pizza. I prefer to use a well seasoned Pampered Chef round baking stone, which also provides you with a place for step 4. 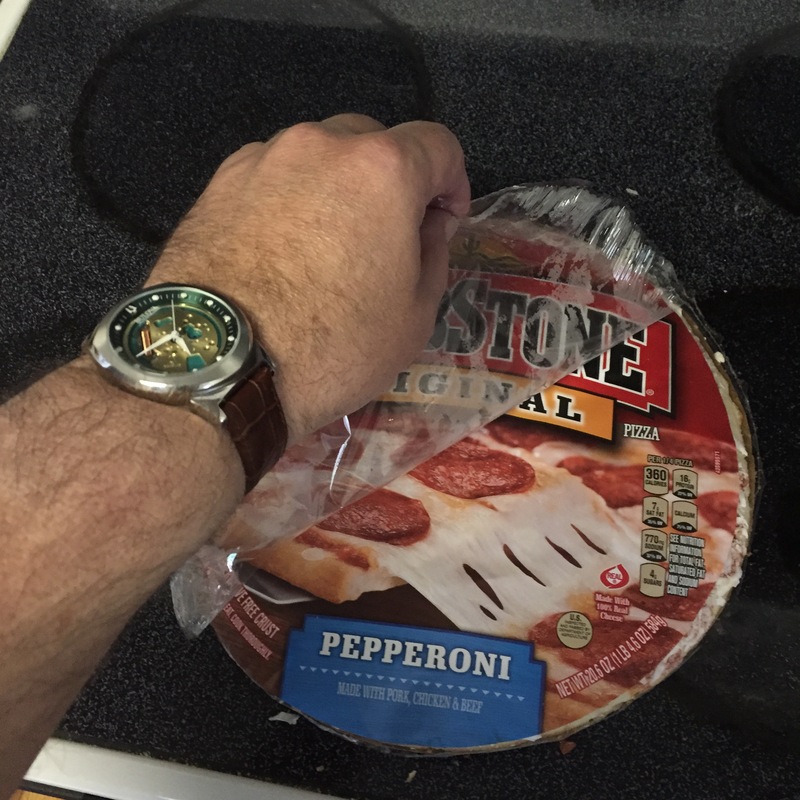 Once the pizza is in, be sure set the timer so you don’t get distracted by the aforementioned phone call, cat fight or commercial and forget about it. In the South, blackened is best left to things cooked on the grill and not on a baking stone. Since I don’t follow the “bake it on the rack” rule, I tend to cook it for 20 minutes because the heat is not as directly on the bottom of the pizza until that stone gets hot. In any case, if the cheese is turning brown, it is probably done and should be removed from the oven. Find something to do for 20 minutes, such as walk the dog, go get the mail, see who is fighting what cause on Facebook and for what reason and wait for the buzzer. Step 4 is to CUT THE PIZZA but first you have to remove it from the oven without dropping it or burning yourself. Baking stones get very hot and you need a good thick oven mitt to work with it. Once the pizza is out, the instructions say to let it stand for 5 minutes but no one in my house waits for hot pizza. 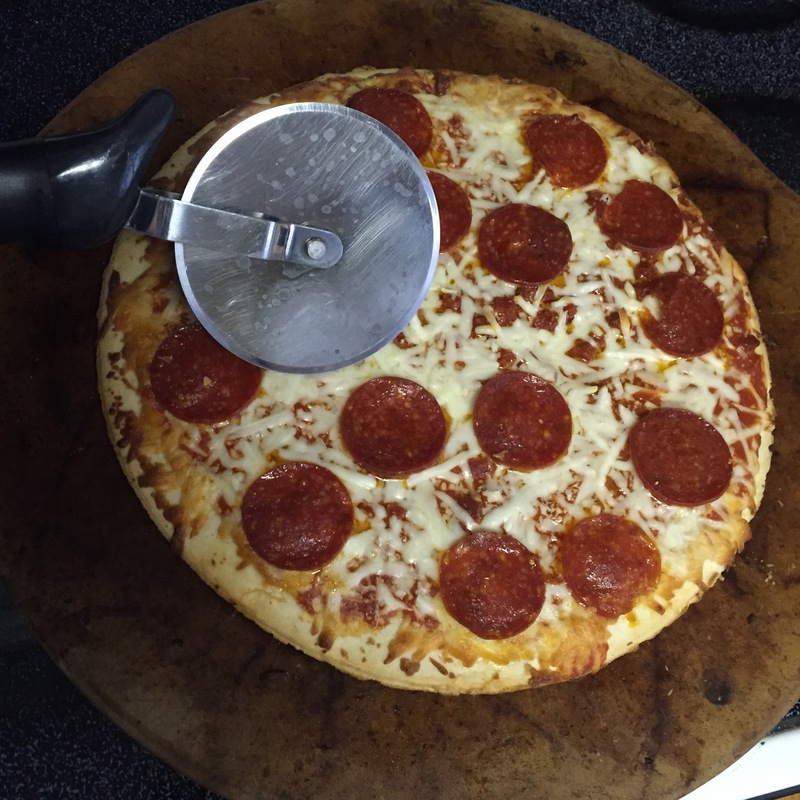 If you like pizza, go ahead and invest in a quality pizza cutter. Don’t get one of those wimpy ones they sell at the supermarket which wobble when you cut. Any decent kitchen supply place sells good pizza cutters and they last forever. These can also be used for cutting other things such as a cookie cake and even a pan of brownies if you are careful. Be sure to eyeball the pizza and try to remember where your cut paths were mapped out by the placement of the pepperoni. You must be sure not to cut a pepperoni in half but if you do, get the pieces off the pizza and eat them while no one is looking. You cooked it, you should get that perk. If they happened to have counted the pieces during prep, you can always tell the kids that one caught on fire. They like stuff like that. 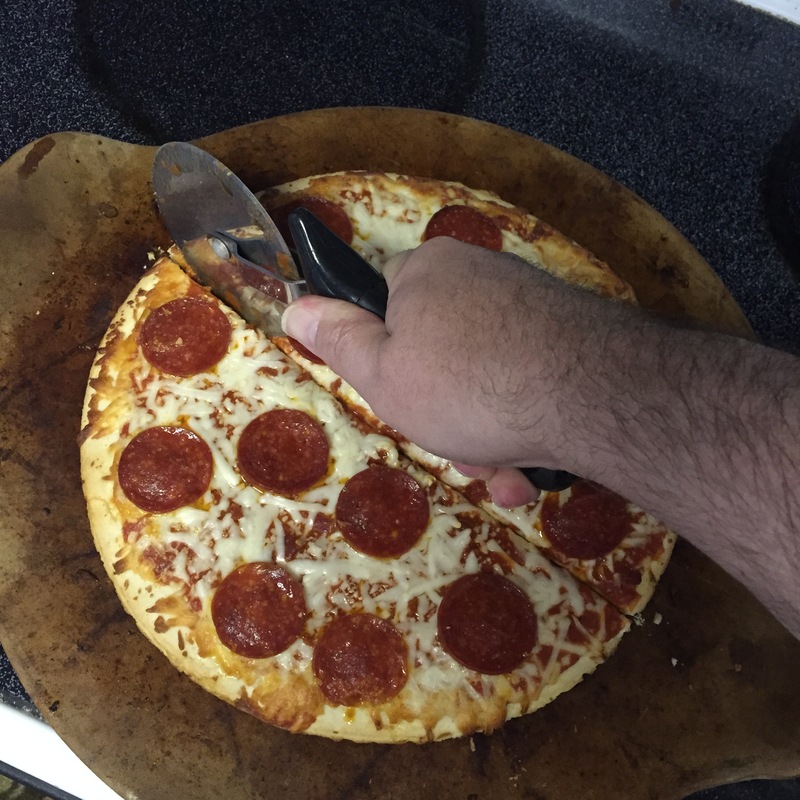 Carefully cut the pizza as shown. When my family is home, we prefer to cut ours into eight slices because then there is more pizza to go around. Just ask anyone under the age of 10. If you are pulling bachelor duty, it doesn’t matter how you cut it but practice in cutting does render perfect results. You are now ready to enjoy the fruits of your labor. I hope this article has been significantly helpful to you and that you have learned all kinds of things that you never knew or even wanted to know about the art of preparing frozen food. If frozen pizza doesn’t sound Southern enough to you, have it with a glass of sweetened iced tea, which requires another article on how that is properly made. If you enjoyed the article and want to read more about living in the South, our crazy family, life in general or other ramblings that I write, be sure to check my blog out at http://www.theliteratepen.com for more information. Best of luck to Cousin Hilary and Greg and welcome to the world, Cousin Natalie!